The Ebac PD120 Dehumidifier is a high capacity machine of similar size and weight to the more powerful PD200. With around half its capacity it is designed as a "partner" unit for the PD200 for use in larger applications where a single unit is insufficient. By offering two dehumidifiers Ebac enables users to select the combination of units which most exactly meets their needs while minimizing energy consumption. 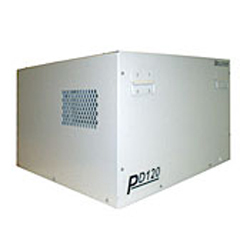 For smaller areas a PD120 may, of course, be sufficient alone and is a powerful and effective dehumidifier in its own right. The Ebac PD120 dehumidifier is designed for use in a variety of locations. It is particularly suited for indoor swimming pools and spas but can be employed with equal effectiveness in fitness centres, aerobic rooms, locker rooms, laundry rooms, warehouses, and stadiums. Due to its rugged construction and capability for operation in harsh conditions this unit may also be used in any industrial or commercial application and in demanding marine environments. The PD120 is a powerful unit and will remove 87 pints of moisture from the air every 24 hours at 80°F and 60% relative humidity. These are the conditions under which the Association of Home Appliance Manufacturers (AHAM) certifies dehumidifier testing in order to set a benchmark for comparison that is fair and consistent. These conditions are more applicable to room dehumidifiers, however, and in the type of application for which this unit is designed conditions are frequently more severe. In the worst conditions the PD120 will extract as much as 160 pints per day. In comparison the PD200 has a maximum extraction rate of 300 pints. In many industrial and commercial applications conditions can be tough on dehumidifiers. Accidental impacts, vibrating and even moving platforms can all damage a dehumidifier unless it is built to withstand them. The Ebac PD120 dehumidifier can pass these tests with flying colours. The component parts are mounted on a robust chassis and enclosed in a sturdy casing, both constructed from heavy gauge steel for maximum strength. The casing itself is further protected by the application of an epoxy powder coating which further limits damage from accidental impacts. With its "armor plating" the PD120 is a durable unit well prepared for the demands of a tough working environment. The PD120 is tough on the inside too with strongly engineered components for reliable performance. These components include a high efficiency rotary compressor which contributes to the energy efficiency of this dehumidifier. A multi-speed fan allows the unit to operate more slowly and quietly when required. An essential feature of a dehumidifier used in many industrial, commercial and generally hostile environments is the capacity for low temperature operation. The formation of ice on the coils of a dehumidifier at temperatures below 65°F will seriously degrade its performance without counter action. The PD120 is equipped with Ebac's hot gas defrost system which automatically clears the ice and allows the unit to operate with full effectiveness at temperatures as low as 33°F. It is this feature above all which makes this dehumidifier so well suited to heavy duty work in demanding environments. The relative humidity of the operating area is automatically controlled by the Ebac PD120's adjustable humidistat. This device can be set to the preferred level and will cycle the unit on and off as required to maintain that setting. This maintains relative humidity at a stable level and preventing continuous and unnecessary operation of the dehumidifier saves energy. Naturally a unit with so great a water extraction capacity collects a considerable volume of water which requires disposal. The PD120 is equipped for continuous drainage by means of a gravity feed to a nearby drain or other outlet. If the distance to the drain of its height above the unit a separate condensate pump will be required to force-feed the water to the outlet. The Ebac PD120 is configured for two installation options as required. The unit may be operated in a free-standing mode which, where practical, is the simpler option. Alternatively if a number of subdivided areas need dehumidification, or if the unit is better located out of sight and earshot, a permanent ducted installation may be chosen.